Why concrete cleaning? If you had to walk past discarded gum and stains on the sidewalk outside your business, you may think twice before returning. With so much competition among businesses, you can be sure that even the intangible parts of the customer experience can contribute to the profitability of your enterprise. Whether you own a medical facility or restaurant, a hotel or an office building, the cleanliness of the concrete on your property can be a critical part of your marketing strategy. Sunburst Environmental’s commercial concrete cleaning team will come to your property to restore your concrete surfaces, ensuring your business has a professional appearance. 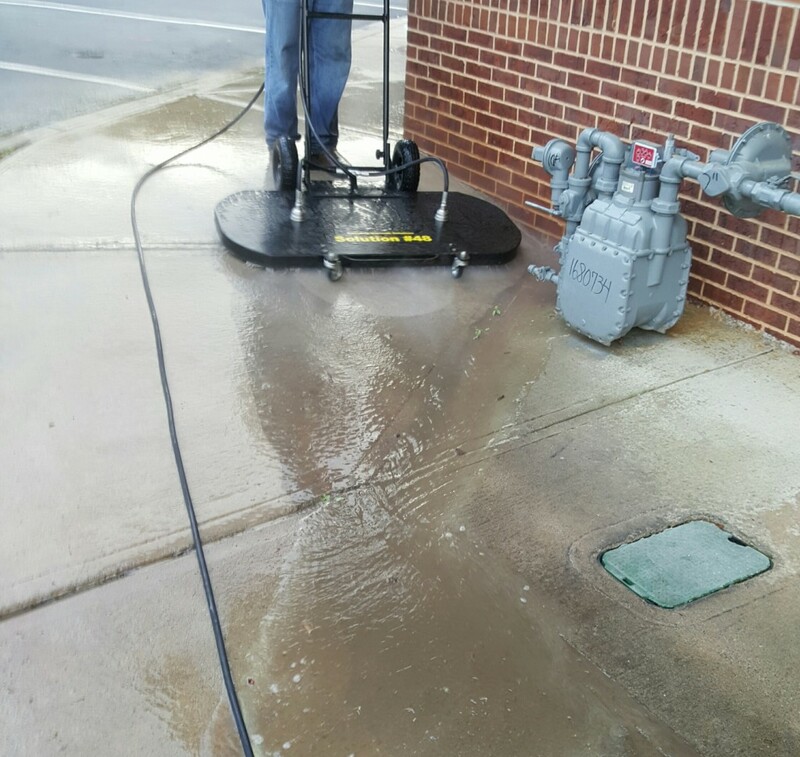 Using both heavy duty truck-mounted pressure washing equipment as well as hand-wheeled units, our trained and insured teams can restore even the most remotely located concrete pads. Our services are ideal for sidewalks, commercial garage spaces, storage areas, parking lots and loading docks. We use our brushing system, biodegradable cleansers and professional pressure washing equipment to give the most thorough results. Contact Sunburst Environmental today for a quote on our commercial concrete cleaning services. Proper preventative maintenance to every parking lot and garage promotes longevity and eliminates unnecessary repairs. Removal of loose dirt and debris from surface areas on a regular basis and with our Sunburst industrial power washing process, your striping will last longer with less chipping and grinding. Your dumpster is simply a large garbage can which holds all types of trash from your business. Let us clean your Dumpster and Dumpster Pad using our heated, self-contained power washing system and eco-friendly cleaners. Keeping it clean ensures that your business isn’t cited for environmental issues in the county, nor will your customers or neighbors see or smell what your business has hanging out back. Sometimes customers don’t visit a store is based on outward appearance. If your building has been marked with graffiti, call on Sunburst Environmental to remove unsightly marks, gang signs and other graffiti swiftly. Rid your location of unsightly gum on your sidewalks, floors and walkways. Call us to rid your walkways of gum spots immediately. Sunburst provides reliable and affordable dumpster cleaning in Alpharetta, Atlanta, Marietta, Kennesaw, Roswell and Woodstock. Call today and schedule your free, no obligation, dumpster area cleaning consultation. Let’s us worry about the cleaning for your business location. 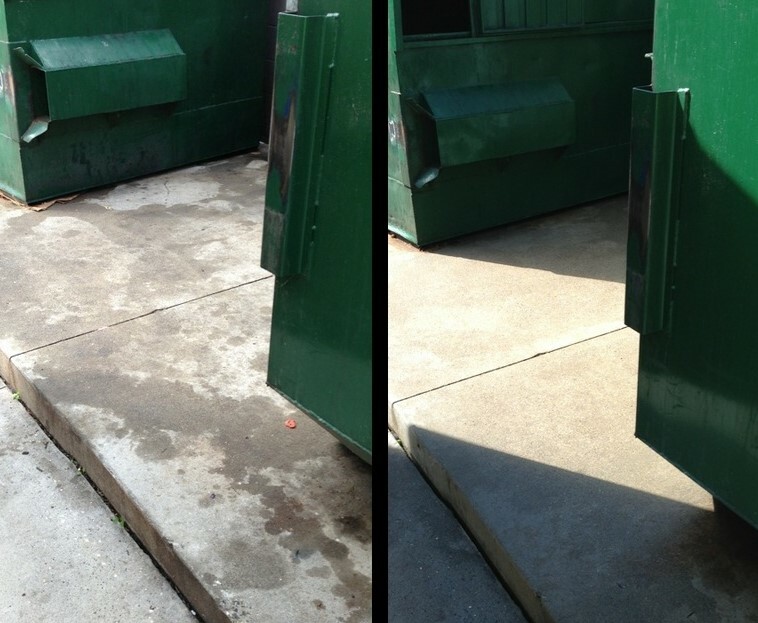 We’ll ensure your walkways, dumpster areas, parking lot and sidewalks are exceptionally clean. Sunburst’s hours of operation can be altered to fit the needs of commercial cleaning services clients. We know and understand that you want a super clean storefront and employee area, without getting in the way of your business; nor having your customers watch us work. Simply give us a call to schedule a time for our commercial cleaning services that fits your business needs.